We’d love your help. Let us know what’s wrong with this preview of A Number of Things by Jane Urquhart. From one of our nation’s most beloved and iconic authors comes a lyrical 150th birthday gift to Canada. Jane Urquhart chooses 50 Canadian objects and weaves a rich and surprising narrative that speaks to our collective experience as a nation. Each object is beautifully illustrated by the noted artist Scott McKowen, with Jane Urquhart conjuring and distilling meaning and magic from these unexpected facets of our history. The fifty artifacts range from a Nobel Peace Prize medal, a literary cherry tree, a royal cowcatcher, a Beothuk legging, a famous skull and an iconic artist’s shoe, as well as an Innu tea doll, a Sikh RCMP turban, a Cree basket, a Massey-Harris tractor and a hanging rope, among an array of unexpected and intriguing objects. To ask other readers questions about A Number of Things, please sign up. I liked the idea of understanding Canada through 50 objects. I had very high expectations from this book. My problem was I found it very biased towards her own background. Many of the objects are very Canadian, but they were told so much through her own eye and history that I found it hard to expand. An example is with the canoe. All Canadians know why the canoe is important to Canada, and is a symbol of Canada, but she spoke so much about her grandfather that it seemed as though she missed an opportunity to give other historical context or stories. My favorite objects were the one she shared a very little (or no) personal connection/story with. I did enjoy the Innu tea dolls, the burnt mask, and the Turban chapters. This book consists of a series of short stories, about things of significance to Canadians. The story about Lady Macdonald is well worth reading---even if you don't read anything else in the book. It is hard to believe what she did. She is an amazing woman! You will have to read the story to find out what happened. After reading Away, I was thrilled to receive an advanced reader copy of A Number of Things: Stories of Canada Told Through Fifty Objects by Jane Urquhart. This literary celebration of Canadian history will be released in time to honour Canada’s 150th birthday! Urquhart’s narrative is combined with detailed illustrations drawn by Scott McKowen who also contributed by providing his own suggestions for the 50 things. An overall theme of gratitude and appreciation was shared for the indigenous people who first inhabitated this beautiful land. Themes of resilience, perseverance and hard work, represented the challenges of building a life in Canada. Although the items became the titles and the pictures, the descriptions meandered and ended up describing other Canadian objects within the original story. For example, the chapter on Rope described Louis Riel who was charged with treason and hung to death in 1885 yet is now widely “regarded as both a hero and that found of that province” (Manitoba). The chapter Samplers told the story of a specific piece of needlework being passed through generations to Canada’s own winner of a Nobel Prize in literature, Alice Munroe. Each story is packed with history and appreciation for Canada! It was surprising to learn, in the chapter Cowcatcher, that Prime Minster Sir John A. MacDonald had a spirited wife who chose to ride the “cowcatcher” of a train during their trip to the West Coast. Looking for excitement and a better view, she shocked the conductor by asking to ride the final 600 miles on the front of the train. Sir John A declined to share this trip and could only be persuaded to join her for 30 of those miles. Following the trip, The Yoho and Glacier national parks were created to preserve the beautiful terrain. The Cherry Tree represented the terrible internment of Japanese Canadians during WW2 (referenced Joyce Kogowa, author of Obasan which is a book on the CBC’s 100 Novels That Make You Proud to Be Canadian list that also includes Urquhart’s novel Away). The history and pride for the Royal Canadian Mounted Police was described by the Horse chapter, telling the tale of Nero, a challenging equine that was described as fierce, yet beloved and who remains preserved at the RCMP heritage centre in Saskatchewan. I also enjoyed reading about the history of Stratford and the building of a hub for Shakespeare, in the chapter Memorial, along with the reference to the philanthropy of Andrew Carnegie who provided financial support for their library (and many other’s across Canada). Somehow, I had missed learning about the history of Lester B. Pearson who had helped create the first Peacekeeping force of the United Nations leading to his Nobel Peace Prize and appreciated reading this in the Medal chapter. Urquhart incorporated her own family history in these 50 things which provides more insight into her Irish-Canadian heritage. The beauty of the 50 Things is that it inspires the reader to consider Urquhart’s choices. Would the reader choose the same items? What would they describe? What is meaningful to their own history of Canada? There are no “right or wrong” answers and the author challenges Canadian’s to research their own list of 50 unique items with a goal of having a greater understanding of our wonderful country! This is a fantastic walk through Canadian history and would be a great book to keep close at hand to discuss, chapter by chapter, interesting facts at the dinner table. I found myself reading sections aloud and sharing details with my own family and realizing how important it is for Canadians to continue their knowledge of this great country beyond what is learned in highschool history classes. It would have made a much bigger book but I find myself wishing that there were 150 items representative of 150 years! Urquhart shared that “Canada is always under revision and probably will remain a work-in-progress as long as it exists”. 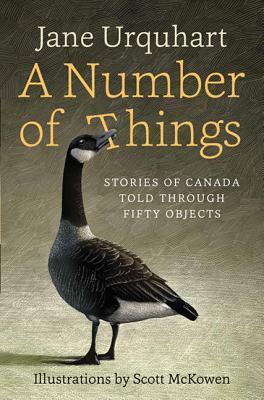 I realize that this book isn't for everyone: it is presented as an overview of 50 items that represent Canada, but really it is more like 50 things that represent Jane Urquhart's Canadian experience. Luckily for me, the things that are important to her seem to overlap significantly with my own experience. This wasn't quite what I expected when I picked it up, as I thought that it was a book of short stories inspired by items. But what it actually is is so much better: non-fiction vignettes spice I realize that this book isn't for everyone: it is presented as an overview of 50 items that represent Canada, but really it is more like 50 things that represent Jane Urquhart's Canadian experience. Luckily for me, the things that are important to her seem to overlap significantly with my own experience. This wasn't quite what I expected when I picked it up, as I thought that it was a book of short stories inspired by items. But what it actually is is so much better: non-fiction vignettes spiced with personal anecdotes, each one beautifully illustrated with a detailed etching. Not every Canadian will agree that the fifty objects chosen are the best to describe our country, but most, I think, will have to agree that Urquhart's "things" are indisputably quintessentially Canadian. This book is a complete pleasure. Award-winning author Jane Urquhart explores Canada's diversity and history with reference to fifty objects. In the course of it she also describes something of her own family's history, which lends an intimacy and casual tone that might otherwise have made this a somewhat dry tome. Each description is relatively short, so they are quick to read. Urquhart's prose is lovely -- so clear and fresh. But the most amazing part of the book is the illustrations by Scott Mc This book is a complete pleasure. Award-winning author Jane Urquhart explores Canada's diversity and history with reference to fifty objects. In the course of it she also describes something of her own family's history, which lends an intimacy and casual tone that might otherwise have made this a somewhat dry tome. This was a great little read. Each chapter highlighted an object, big or little, that is deemed to be important to Canada's history. Did you know that Sir John A. MacDonald’s wife, Lady Susan Agnes, rode a cow-catcher through the Rocky Mountains? I never knew that. Skates dance halls, wooden snowmen are all highlighted here. This is an easy read, and quick. I defy any Canuck not to feel choked-up after reading each one of these superbly crafted short musings on the Canadian identity. Sentimental most of the time, but never too hokey, there is some lovely character searching going on in these pages. Disappointing to say the least, this collection of essays doesn't reflect all of Canada that is purported to do from the statement on the cover. Once again everything in Canada is related to Ontario. Oh, except for the chapter oon rope, which is about the hanging of Riel. I loved this book. In these fifty stories of fifty objects Urquhart presents little treasures of Canada. So moving, inspirational, known and unknown. Powerful and simple. The illustrations by Scott McKowen deepen the stories of Canada past, present, and looking towards the future. Brilliant. (view spoiler)[Last story, ENDS the book. Framing. "IN THE ROYAL BRITISH COLUMBIA MUSEUM IN Victoria, there is an important piece of what the curator calls 'museum theatre.' A reconstructed Haisla mask, partly I loved this book. In these fifty stories of fifty objects Urquhart presents little treasures of Canada. So moving, inspirational, known and unknown. Powerful and simple. The illustrations by Scott McKowen deepen the stories of Canada past, present, and looking towards the future. Brilliant. It BEGINS with this story of the Beothuk. "AS A MOTHER, NOTHING IS MORE TERRIFYING to contemplate, or thinkably tragic to experience, than the death of your child. But if you are on the cusp of extinction—one of the last mothers of your culture, burying one of the last children—this appalling sorrow expands to even greater proportions." In the intro, Urquhart speaks to diversity and honouring indigenous so eloquently. We have so much more to learn and to atone. She does not look away. Urquhart was asked to write about 50 objects, in honour of Canada's 150th birthday. With chapters with titles such as "hat", "books", "horse", and "lighthouse", you don't really know what to expect, but the short stories/vignettes are written kind of like those Canadian Heritage moments we used to see on TV, with some more personal stories thrown in by the author to celebrate her own background. The book touches upon our major cultural icons - Emily Carr, the Group of Seven, Stompin' Tom, etc. - Urquhart was asked to write about 50 objects, in honour of Canada's 150th birthday. With chapters with titles such as "hat", "books", "horse", and "lighthouse", you don't really know what to expect, but the short stories/vignettes are written kind of like those Canadian Heritage moments we used to see on TV, with some more personal stories thrown in by the author to celebrate her own background. The book touches upon our major cultural icons - Emily Carr, the Group of Seven, Stompin' Tom, etc. - and political figures from John A. to Justin Trudeau, and includes objects from all over the country. It is very inclusive, and Urquhart does not hold back on her personal opinions when it comes to Indigenous and environmental issues, and especially of the immigrant experience, which serves as the backdrop for so many of these stories. The illustrations are stunning scratchboard, done in black and white. They are truly incredible, but it was an interesting choice to have an artist make renderings of the objects, many of which are readily accessibly in museums and could have been included as colour photographs. I found myself wanting to photocopy individual chapters for certain people, knowing how much the object and its describing text would appeal to certain friends and coworkers. My personal favourite, however, was "cowcatcher" about Lady Macdonald. While many of the historical facts covered in the book were already known by me (for the most part), I had never heard any stories about Lady Macdonald being such a fascinating character. I am very tempted to read her memoir written on that now-famed train ride. As a Canadian history nerd, I found this a quick and utterly fascinating read. But with its art, personal reminiscences, and the multicultural nature of the objects, I firmly believe it would appeal to almost anyone. Especially in this historic birthday year. This book contains a list of 50 objects, complete with description, history, significance, and why it relates to Canada as a whole. I was initially concerned that 50 objects would be a marathon, yet somehow this book absolutely engaged me as a reader. There is such a fascinating variety of objects here and I never knew what was coming next. The book brought a smile to my face when I recognized an object and instilled a curiosity when I didn’t. While some of the items deeply resonated with me – Si This book contains a list of 50 objects, complete with description, history, significance, and why it relates to Canada as a whole. I was initially concerned that 50 objects would be a marathon, yet somehow this book absolutely engaged me as a reader. There is such a fascinating variety of objects here and I never knew what was coming next. The book brought a smile to my face when I recognized an object and instilled a curiosity when I didn’t. While some of the items deeply resonated with me – Sir Isaac Brock’s hat, or a cross stitch sample – many did not, but instead exposed me to many of the cultures and histories that make up the fabric of Canada. Urquhart skillfully explains how each object is connected to the people and places of our country and why it is significant. It made me incredibly happy that not only did I feel represented but that I was taught something as well. The only drawback to the book is that some objects are very strongly personal to Urquhart, and are accompanied by personal anecdotes in the description. While these objects do connect to the larger picture of Canada, they contrast sharply to the objects that are historic and have a textbook description. I had very mixed feelings about the inclusion of personal stories; while this was Urquhart’s version of Canada, the personal touches felt out of place and more appropriate for a memoir. Thanks Lisa for the gift of this book and for sharing our love of Jane Urquhart's work. What a great read for Canada's 150th anniversary! I loved the choice of objects and the illustrations for each - really love the illustrations! Love the Canada goose on the cover!!! I learned so much reading this book. Really love the modelling Jane Urquhart does in researching and valuing her own family historical threads in Canada and how deep the roots of the objects and the stories that surround them take Thanks Lisa for the gift of this book and for sharing our love of Jane Urquhart's work. What a great read for Canada's 150th anniversary! I loved the choice of objects and the illustrations for each - really love the illustrations! Love the Canada goose on the cover!!! I learned so much reading this book. Really love the modelling Jane Urquhart does in researching and valuing her own family historical threads in Canada and how deep the roots of the objects and the stories that surround them take her own sense of being Canadian. Was glad that not all the objects selected were connected to Urquhart's roots, but there were just enough throughout the book to make it personal. And that inspires me to delve deeper into my own Canadian roots. I really appreciate being inspired to act by reading a book. I loved learning how many of the places mentioned in this book are places that I am familiar with. Snowman was a fave object for many reasons, the connection with Norval Morrisseau being just one. Temple another fave, a place I go as often as possible because it is so sacred. Ferry was memorable - a trip with Mom, Dad, Lisa on a blistering hot summer day. Codfish memorable. Mountain Spirits - a trip to Victoria and the Royal British Columbia Museum. Robe and Stratford. Rope was an amazing way to tell the story of Louis Riel's contribution to Canada. Loved this read. Passing the book on to Aunt Noel to enjoy! I liked the idea of celebrating Canada's 150th year by reading a book of Canadian stories told through 50 objects. Jane Urquhart is 67 years old, comes from a family of Irish-Canadian farmers based in Ontario. I'm 47 years old, have lived a mostly suburban/urban life, but come from a family of farmers in Manitoba. So, I was not at all surprised that I associated very easily with each of the objects Urquhart chose. Although, I did not know about the snowman in Beardmore! Most of the stories are a I liked the idea of celebrating Canada's 150th year by reading a book of Canadian stories told through 50 objects. Jane Urquhart is 67 years old, comes from a family of Irish-Canadian farmers based in Ontario. I'm 47 years old, have lived a mostly suburban/urban life, but come from a family of farmers in Manitoba. So, I was not at all surprised that I associated very easily with each of the objects Urquhart chose. Although, I did not know about the snowman in Beardmore! Most of the stories are about objects from Canada's past. I do feel one object from Canada's past is missing - a child's wooden rocking chair. The only real new object that stood out was the BAPS Shri Swaminarayan Mandir just north of Toronto that opened in 2007. Jane Urquhart makes no bones that these are objects she picks - and she does a wonderful job telling tales about each of them, pulling in personalities and regional flavours. I wonder though, what a new Canadian would make of these stories. Certainly they would be an introduction to objects that might otherwise remain unknown to them, for example, Ontario school readers, but I don't think they'd feel the same sense of connection. It is very much a personal choice driven book. Infact some essays seemed as if they are just written to talk about her own family members and ancestors. However, I still very much enjoyed reading this book, and learnt several things about different aspects of life in Canada. The best part for me was that her stories were quite diverse and inclusive. I think this would not have worked if she decided to be impersonal in her choice of objects. For anyone who thinks Canadian history is dull or a bit too much to bite into, this is the perfect way to access it. Jane Urquhart discusses various parts of Canadian history through Canadian objects. Each object is given a few pages in which she discusses its significance to Canada, either for Urquhart herself, or for Canada as a whole. It is the type of book you read, only to want to know more about what it has discussed. Stories of Canada told through 50 objects for Canada's 150 birthday. Objects like Indian legging, Massey Harris tractor, glass dogs that belonged to Lucy Maud Montgomery which seemed just a path to give a quick look at her life, a look at Lester B Pearson's life using the Nobel Peace Prize that he was awarded in 1957; Acadian oysters. Parts were quite interesting and they were just short little bites. I found this book ranged from mildly interesting to "meh" to downright tedious. The author writes well, the language she uses to describe these objects is skilled, but I just couldn't summon the interest to care about most of the items she chose as representative of our country. Sadly, I really didn't feel a connection to them, perhaps because of the strong biographical bent to her storytelling. A wonderful blend of all the things I love and the things I am concerned about when it comes to the country I love. Urquhart's narrative about 50 things is brilliant, personal, reflective, and inspiring. Reading it was like meeting up with a friend for coffee and chatting about shared memories. This is a big county, yet it's small and connected coast to coast to coast. An interesting and very unique book about Canada in honour of its sesquicentennial. Each chapter focuses on an object that the author has selected as being important to the story of the country. The writing and the accompanying illustrations are beautiful. I loved that she stayed away from the obvious (beavers, maple leaves, etc.) and dug a little deeper. Picked it up to read for Canada's 150th. Very interesting, but wish I could have picked over the, in time to let sections digest, instead of reading right through (had it from the library). This approach to the book made it a little dry for me by the end, though there were "things" she wrote about that were deeply fascinating and made me look into them more deeply. Interesting short stories. All definitely connected to Canada but many of these are really from Jane Urquart’s own life experiences. Some fascinating titbits are woven through this book and certainly make it a worthwhile read. I know many others really liked it but it was just okay for me. I think partly because it was so personalized to Ms. Urquhart's experience. I found the ones I preferred were the ones that were not quite as personal. I really enjoyed this book. Each chapter is a small snapshot of Canadiana told through objects. I laughed out loud over the antics of Sir John A MacDonalds wife. The personal observations of Ms Urquhart were also enjoyable. She is the author of seven internationally acclaimed novels entitled, The Whirlpool, Changing Heaven, Away, The Underpainter, The Stone Carvers, A Map of Glass, and Sanctuary Line. The Whirlpool received the French Prix du Meilleur Livre Étranger (Best Foreign Book Award). Away was winner of the Trillium Book Award and a finalist for the prestigious International IMPAC Dublin Literary Award. The Un She is the author of seven internationally acclaimed novels entitled, The Whirlpool, Changing Heaven, Away, The Underpainter, The Stone Carvers, A Map of Glass, and Sanctuary Line. The Whirlpool received the French Prix du Meilleur Livre Étranger (Best Foreign Book Award). Away was winner of the Trillium Book Award and a finalist for the prestigious International IMPAC Dublin Literary Award. The Underpainter won the Governor General's Award for English-language fiction and was a finalist for the Rogers Writers' Trust Fiction Prize. The Stone Carvers was a finalist for the Giller Prize and the Governor General's Award, and was longlisted for the Booker Prize. A Map of Glass was a finalist for a regional Commonwealth Writers' Prize for Best Book. She is also the author of a collection of short fiction, Storm Glass, and four books of poetry, I Am Walking in the Garden of His Imaginary Palace, False Shuffles, The Little Flowers of Madame de Montespan, and Some Other Garden. Her work has been translated into numerous foreign languages. Urquhart has received the Marian Engel Award, Calgary's Bob Edwards Award and the Harbourfront Festival Prize, and is a Chevalier dans l’Ordre des Arts et des Lettres in France. In 2005 she was named an Officer of the Order of Canada. Recently, she was named the 2007 Banff Distinguished Writer. Urquhart has received numerous honorary doctorates from Canadian universities and has been writer-in-residence at the University of Ottawa and at Memorial University of Newfoundland, the University of Toronto, and the University of Guelph. She has also given readings and lectures in Canada, Britain, Europe, the U.S.A., and Australia. Lucy Maud Montgomery as part of Penguin’s “Extraordinary Canadians” series. Urquhart lives in Northumberland County, Ontario, Canada, and occasionally in Ireland.